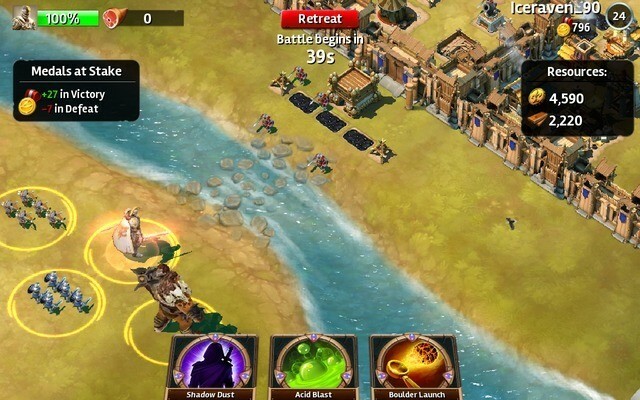 Siegefall is a visually-stunning mobile strategy title from Gameloft. The game’s “Magic Cards” system is what makes it stand out from the crowd. Some cards can help players inflict major damage to enemy stronghold, whereas others provide tactical boosts to troops. Gameplay is a bit tougher than other mobile strategy games, but easier than Dawn of Titans, another stunning RTS game. Players don’t have complete control over their troops, although one can control a hero unit and move him/her anywhere he wants. Players can’t reassign targets to troops. Once a target is assigned, troops will destroy it and then start attacking the next structure. The game has a medieval setting and players have been given full control to design their kingdom’s layout. In case you are having trouble putting up a strong defense or losing PvP battles in Siegefall, follow these quick tips and tricks. Have all buildings and most importantly, your Keep, inside walls. They are your kingdom’s first line of defense and will protect it from invading troops. Upgrade walls regularly to make it harder for enemy troops to enter and loot resources. Tap on the gate to level-up walls. Go for additional protection by placing barricades just outside or inside the gate. You may also place barricades around resource-generating buildings/gold storage to protect them from enemy attacks. Keep in mind that enemies will target such buildings as destroying them will earn them food, which will then be used to spawn extra troops. Keep such buildings under the watchful eyes of towers, mortars and other defense weapons. You can see a defense building’s attack range by tapping on it. Keep key buildings under their range. Barricades will slow down enemy attacks or redirect enemies, giving opportunity to defense structures and outpost guards to take them out easily. A Tar Pit is another useful trap. Placing it in and around key buildings or just outside the city walls/gate will slow down enemy movement, giving defense buildings enough time to eliminate them. If you have placed them outside the city walls or in front of the gate, then make sure these pits (or other traps) are backed by towers/mortars. Place a set of tar pits closer to each other in a line or in a row to slow down more enemies at once. Build a Workshop ASAP to upgrade traps like barricades, tar pits, spike traps and explosive barrels. The Workshop also upgrades your troops. Upgraded traps like barricades will become more resistant against enemy attack. Leveling up the Tar pit will make enemies slower than before. Upgraded troops become more powerful. Level-up your workshop frequently to if you want to level-up traps and troops. For example, upgrading your Workshop to level 6 will allow you to level up the Tar Pit and the Spike Trap. Tap on your workshop and then tap on the info button to find out upgrade benefits. Build and upgrade the Outpost. It contains troops that will defend your kingdom against enemies. Place it closer to your Keep. An upgraded outpost contains more troops and reduced spawn interval. 1. Have more than one resource generating building in your kingdom. Max out if possible. Upgrade the keep to add more Farms, Wood Storage and other buildings. The more buildings you have, the more resources you will receive/store. Don’t forget to level up such buildings to increase their storage capacity, production rate and health. 2. You will need plenty of wood to upgrade your Keep. It’s your Keep that unlocks additional traps, walls, towers, battle camps and resource buildings. Upgrade Wood Storage to increase wood capacity and level-up your sawmill to increase wood production per hour. This will ensure faster wood production and storage. Also, keep playing story missions and raid human players’ kingdoms to collect wood. 3. 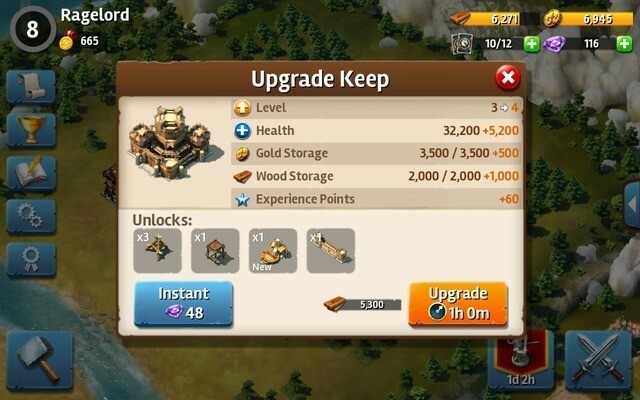 To unlock and recruit additional troop types, upgrade your Keep, Barracks and the Battle Camp. Upgrading keep will just allow you to recruit a new troop type. You will have to level-up your Barracks to unlock it completely as well as the Battle Camp if you want to use it on the battlefield. For example: I had to upgrade my keep, the barracks and the battle camp to unlock the Troll. 4. In Siegefall, you earn medals by winning PvP battles. The more medals you receive, the better the rewards. Tap on the marketplace to receive your daily rewards, which could be gems, magic cards or magic dust. You have to choose any one reward from these 3 rewards. I would recommend choosing the Magic dust as it lets you craft the ultimate magic card. You don’t get magic dust easily, and regular cards aren’t that difficult to craft. The second best option is gems as they are “premium currency” and not easy to earn. 5. Remember that you earn medals only when you defeat a player in PvP battles. However, some medals will be forfeited from your total medal count if you lose a battle. In story-based missions, you earn only wood and gold. Before pressing the Attack button, you should tap on the “Scout” button to spy on enemy resources. Try to invade those who have a weak layout. A kingdom with fewer walls can be a good target. Always have different troop types in your army. Choose a combination of troops that will be the most effective in battle. Experiment with different types of troop combos in story-based missions and challenges, where you don’t lose medals. Once you find a good combo, use it to invade a player’s kingdom. I use a combination of archers, trolls, footman and rogues to invade enemy kingdoms. Archers can shoot over walls and footmen can be quite effective against outpost guards. Trolls can destroy enemy walls in seconds and can inflict massive damage to buildings. They can also take a lot of damage. Rogues can take down low-health buildings and remain undetected by ranged defense weapons until they attack. Use them to sneak into unprotected buildings i.e. those buildings that are not covered by towers and resource-generating buildings. Every building you destroy increases your food count. The food earned can be used to recruit additional soldiers. When the required amount of food is met, a troop’s camp glows. Pay attention to the troop type symbol on each camp (archer symbol, troll symbol, footman symbol etc.) and tap on it to spawn new battle troops. If all slots are glowing, then select a troop type which you think can be best option for the current situation in the battlefield. I usually choose archers or the troll so that I can destroy buildings faster. You may also re-spawn your hero, but to do this you will need to earn more food. You can move your hero to any place anytime, but you cannot move your troops. Once you have chosen a target by drawing a path from the camp to the chosen structure, your troops will destroy it and then choose the next closest target. Make sure you choose a target that’s not heavily guarded by towers or other defense structures. You may also command one troop to target defense buildings and other troops to target revenue-generating buildings. This way, you will earn food faster. The food earned can be used to get reinforcements (additional troops). Move your hero when he is being attacked by projectile weapons. Heroes may be powerful, but they can lose HP faster. A hero automatically uses a special ability when you use him/her to target a building. Heroes will automatically attack nearby enemies, but you should move him to a safer place and then target weaker buildings if he is surrounded by defense buildings. Try to defeat higher-level players to get more medals. Even if you lose, few medals will be deducted from the total medal count. Magic cards in Siegefall play a key role in battle. You may acquire magic cards via the Card Crafter or as daily rewards from the marketplace. You will need gold to create regular cards and magic dust to create ultimate cards. Magic dust can be acquired as a reward via the marketplace or inside loot chests. The cards received as reward or created using Card Crafter is protected by the Card Keeper. This is where you manage your battle deck. You will need to drag and drop those cards to your deck that you want to use it in the battlefield. Because cards are randomly created in the Card Crafter, you will get plenty of duplicate cards. You will need to free up card storage space and so you have the option to “burn” them. Every card that you burn will earn you some gold. Instead of burning them for gold, use them in the battlefield. Every card is useful and can do massive damage to enemy buildings. Never burn those cards that deal massive area damage (Fire Dragon, Acid Blast, Boulder Launch etc.). 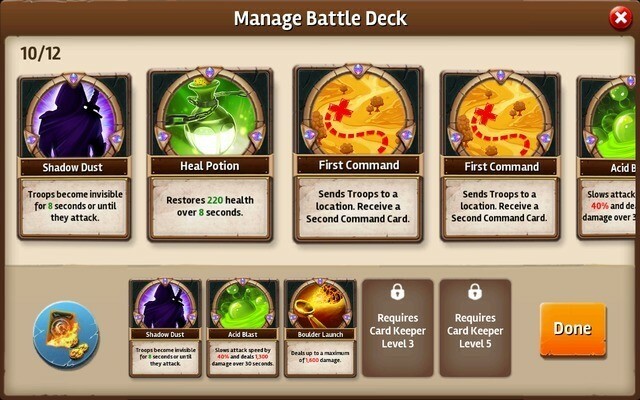 Upgrade the Card Keeper to increase card storage and battle deck slots. The more battle deck slots you have, the more magic cards you can take to battle. Increased card storage will hold more cards earned form loot or the Card Crafter. Before dragging and dropping a card on enemy territory, check its damage radius. Some cards can injure your troops, so make sure your army is at a safe distance. The best strategy would be to use high area damage cards before commanding your troops to attack the enemy stronghold. Use it to weaken their defenses and then attack resource-generating buildings. You may also use a magic card with a small damage radius to destroy weak buildings and defenses while your troops attack the enemy stronghold (just keep in mind that your troops are safe from the damage circle). This will give you food, with which you can spawn additional battle troops. Use the Ice Blast card to disable defensive towers. The Haste Boots card can help your troops move faster and avoid the mortar tower. The Arrow Volley Spell card has the ability to disable hidden explosive barrels. Use it before commanding your troops. The Final upgrade of siegefall is worst. Don’t install this upgrade otherwise you will have to delete it.